Tommy Watson is a senior elder closely tied to the traditions and sacred beliefs of Pitjantjatjara People, but he resists painting as a tool to lay bare this philosophy. As viewers, we would be mistaken in trying to discern any concrete narrative even though his paintings refer to traditional stories and places. Instead, his paintings are abstract meanderings and meditations on colour, always inextricably linked to a spiritual attachment to the land. In this way, Watson conveys the intangible nature of the land and its sacred mythologies. In this work there is a palpable sense of experimentation and play. This is demonstrated by the shifts in patterning; at times we see swirling constellations, in others more discernible geometric shapes. The use of dots, repeated and seemingly endlessly, has the effect of a constantly dynamic visual field, pulsations which ripple across the canvas. At times we see striking contrasts such as lurid blue against a blood red or bright yellow on orange. It makes sense that Watson works intuitively, allowing the lines of colour to travel organically across the canvas. “We were saddened to hear of the death of Yannima Pikarli Tommy Watson today. On behalf of Art Series Hotels, I want to express my sincerest condolences to Tommy Watson’s family and friends; our thoughts are with them. Tommy Watson is thought to have been born sometime around the 1930’s. His early childhood was spent travelling from water hole to water hole, hunting and gathering and learning from his father the practical skills on how to survive on their lands in the arid regions of the Gibson Desert. Watson started to paint in 2002 and went on to become one of Australia’s greatest indigenous artists; his works are included in many major institutions, including a permanent ceiling installation in the musée du quai Branly in Paris. 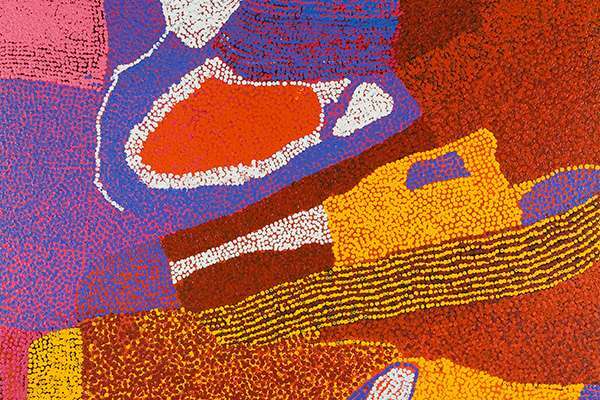 One of Australia’s greatest Aboriginal artists, Yannima Pikarli Tommy Watson was a senior Pitjant-jatjara leader. He grew up living a traditional nomadic life in the semi-arid country at the edge of the Gibson Desert. Learning about his country, culture and tjukurpa from his father and grandparents, he developed a deep spiritual connection with his country. Yannima Pirkarli, or Tommy Watson as he is now known throughout Australia, was born circa 1935 in the Anangu Pitjantjatjara Yankunytjatjara (APY) Land, which covers a large terrain across Western Australia, Northern Territory and South Australia. Pirkarli refers to a sacred flat rock, and Yannima is a site near where the artist was born. He lived a semi-nomadic life with his father until his early teens, when he moved to Ernabella Mission to live with his uncle, Nicodemus Watson, whose surname he assumed as his own. As a young man, he worked as a stockman at Mt Ebenezer Station, where he was called Tommy. 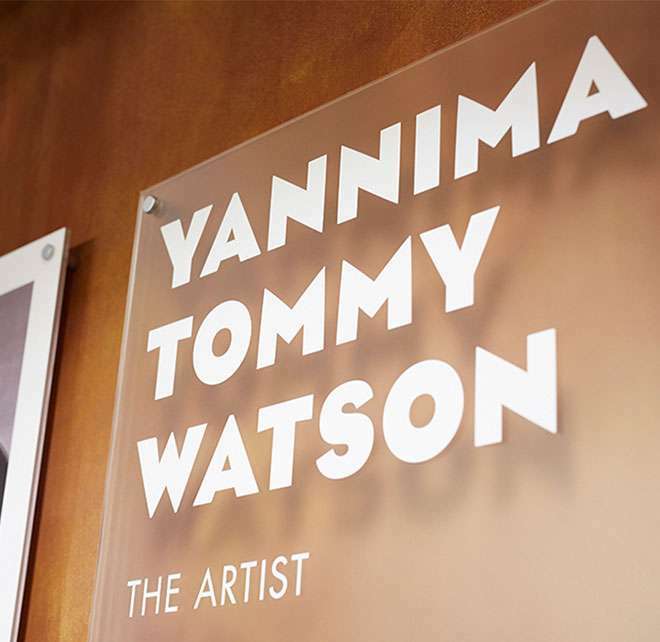 The haphazard etymology of his name aptly demonstrates the way Yannima Pirkarli Tommy Watson lives between different worlds. In unearthing influences we discover that during the fifties, Ernabella Mission introduced bright acrylic paints for the production of posters and postcards. Watson also spent time at Hermannsburg where he watched Albert Namitjira paint. Namitjira is one the most widely known and loved Aboriginal artists who painted landscapes in the European tradition. Later, when Papunya Tula Art Centre opened in 1971, Watson associated with artists such as Shorty Lungkata and Uta Uta Tjagala. 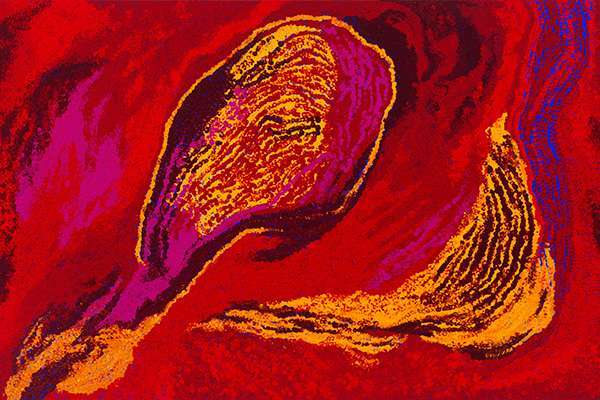 It is here that he absorbed the broad intense colour palette associated with Aboriginal desert painting. Tommy Watson began painting in 2001 as a founding member of the Irrunytju Arts Centre at Wingellina, Western Australia. Irrunytju is situated near the tri-state border of the Northern Territory, Western Australia and South Australia, approximately 720km south-west of Alice Springs. His work has since been exhibited throughout Australia and is represented in numerous significant public and private collections, including the Art Gallery of New South Wales, National Gallery of Victoria and the National Gallery of Australia. In 2005 he was commissioned to create Wipu Rockhole, now permanently installed on a ceiling at the Musée du quai Branly in Paris. This commission assisted in establishing his reputation as one of a handful of internationally acclaimed Aboriginal artists. Tommy Watson was a senior elder closely tied to the traditions and sacred beliefs of Pitjantjatjara People, but he resists painting as a tool to lay bare this philosophy. As viewers, we would be mistaken in trying to discern any concrete narrative even though his paintings refer to traditional stories and places. Instead, his paintings are abstract meanderings and meditations on colour, always inextricably linked to a spiritual attachment to the land. In this way, Watson conveys the intangible nature of the land and its sacred mythologies. In each work there is a palpable sense of experimentation and play. This is demonstrated by the shifts in patterning; at times we see swirling constellations, in others more discernible geometric shapes. The use of dots, repeated in a seemingly endless way, has the effect of a constantly dynamic visual field, pulsations which ripple across the canvas. At times we see striking contrasts such as lurid green against a blood red or deep blue on orange. Elsewhere, in a series of work from 2009 which verges on the monochromatic, the works demonstrate subtle gradations of oranges, pinks and reds. Watson is able to confidently work on large canvases in a way that captures the largesse of this landscape. The intensity of line and colour radiate with a breathtaking presence - he is without doubt a remarkable western desert artist. The selection of the works for The Watson was in direct consultation with the artist and Ken McGregor, who has a long association with the artist and regularly travels to Watson’s studio in Alice Springs. The selection for The Watson spans from 2005 to the present and includes paintings and giclée prints. To start painting at the age of sixty-six, we might imagine how for Watson, painting has replaced earlier, more physical endeavours. It is as though each dot takes the place of a footstep. 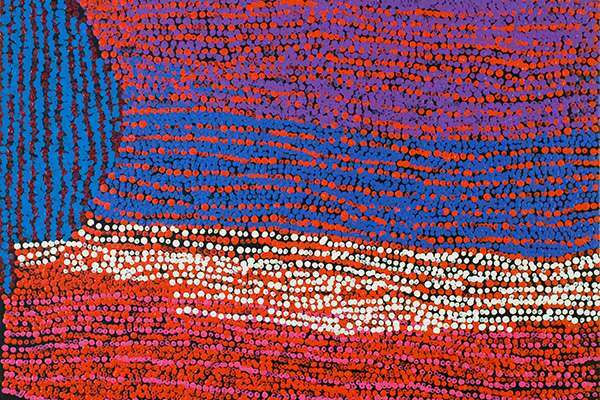 In this light, his paintings are abstract re-visitations of the Pitjantjatjara country the artist knows so intimately. He is an artist that has ‘walked' his country, both physically and emotionally, and he clearly celebrates and captures this vast and rich country. In an era where everything can be downloaded or googled or somehow “known” so easily, it’s a relief to have some quiet moments to contemplate the unknowable.